Founded 60 years ago, Kimco Realty (KIM) is one of North America’s largest publicly traded owners and operators of open-air shopping centers. As of March 31, 2018, the company owned interests in 475 U.S. shopping centers comprising 81 million square feet of leasable space primarily concentrated in major metropolitan markets along the coast. Over 80% of the firm’s rent comes from centers located in large, affluent, and rapidly growing urban areas. Kimco Realty is focused on owning the nation’s largest collection of open-air shopping centers, which appear to be reasonably well-positioned to take on the increasing popularity of e-commerce. In fact, management estimates that 95% of the REIT’s rent is from e-commerce resistant tenants. For example, 74% of Kimco’s revenue comes from grocery-anchored centers. While a growing number of consumers and supermarkets are adopting online grocery services, physical stores still offer last-minute convenience, and many shoppers are resistant to purchasing groceries online. The steady traffic generated by grocers is a boon to retailers nearby and seems likely to persist for the foreseeable future. The majority of Kimco’s smaller tenants (60%) are also involved in services that are not easily obtained online, and nearly 40% of the firm’s rent comes from retailers that are already incorporating online sales (omnichannel) into their business models. In fact, despite what you may have heard about the “retail apocalypse”, the reality is that in 2018 analysts are projecting over 3,000 net store openings. While older mall-based retailers may be struggling and going bankrupt, plenty of retailers are performing well. Kimco is focused on obtaining them as its tenants. 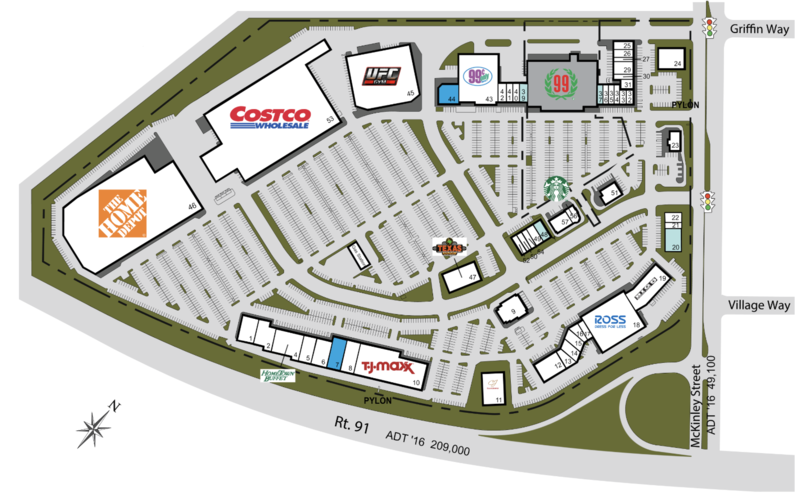 Kimco’s tenant base is highly diversified with minimal exposure to struggling retailers. For example, the firm’s largest tenant is TJX Companies (TJX), and that retailer only represents 3.8% of Kimco’s annual base rent (ABR). And while it does have some exposure to bankrupt companies (such as Toys R Us), it is limited to 22 centers that make up just 1.2% of rent. What’s more, Kimco’s top 50 tenants make up just 49% of its annual rent, showing that the REIT’s cash flow is well-diversified and thus more stable over time. Another key to Kimco’s success over time has been its focus on the largest and most affluent markets. Approximately 82% of the REIT’s rent comes from America’s largest 40 metro areas where rent per square foot is high thanks to solid retail sales growth. Kimco leverages its strong property locations to negotiate long-term leases with tenants to maximize cash flow stability. For example, over the past year the average lease it has signed has been for a seven-year duration. The company’s focus on e-commerce resistant tenants and the largest and most profitable markets is why Kimco enjoys relatively strong fundamentals. For example, the REIT’s occupancy rate is 96.1% (up 0.8% in the past year), and in the most recent quarter it generated lease spreads of 15.6% (10.5% over the past 12 months). Lease spreads are the change in rent on existing locations when a lease expires and the tenant renegotiates for a new one. Kimco has now reported 16 consecutive quarters of lease spreads of at least 10%, indicating that the locations of its properties remain strong enough to continue creating some pricing power with its tenants. Furthermore, all of its key fundamental metrics, such as lease spreads, occupancy, and rent per square foot, have been trending up over time. That’s because brick-and-mortar retail sales, while growing slower than online sales, continue to track the economy as it expands. While growth in these metrics is nice, one of the most important aspects of a good REIT investment is a strong balance sheet. This is not only crucial to maintaining a safe dividend, but also to allow a REIT to grow profitably over time. That’s because REITs are required to pay out 90% of taxable income as dividends. Since they are left with less retained cash flow compared to other types of businesses, REITs must borrow large amounts in order to grow their property portfolios, cash flow, and dividends over time. Fortunately, Kimco’s management team has taken a conservative approach with debt. All of its debt is long-term in nature with a weighted average duration of 10.7 years, lowering its sensitivity to rising interest rates. In addition, the REIT enjoys below average leverage which has earned it a BBB+ credit rating from Standard & Poor’s (only 11 other REITs have the same or higher rating). As a result, Kimco should be able to continue borrowing at relatively low interest rates. Besides debt financing, REITs fund their growth through a combination of: retained cash flow, equity (issuing new shares), and recycling capital (selling properties at a profit). Kimco’s management team has done a nice job of balancing its funding sources to allow the firm to grow its FFO per share over time, and thus maintain a secure and rising dividend. For example, this year management is expecting to sell $800 million in properties at a generous profit. Proceeds will be reinvested into Kimco’s development pipeline which includes almost $800 million worth of property improvements planned over the next few years. Management also has over $2 billion in potential investment opportunities Kimco can pursue to continue driving consistent growth in cash flow and dividends over time. To help fund these opportunities, the REIT has $2.25 billion in total liquidity (cash plus available borrowing capacity). 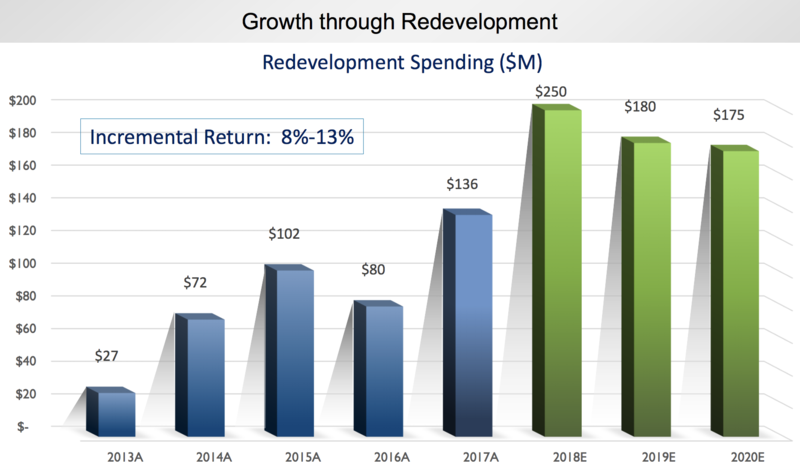 Most of the REIT’s growth plans are focused on improving its existing properties. Specifically, management is increasing the amount of service and experiential-oriented facilities it can offer tenants. These are the most e-commerce resistant layouts and are what consumers are currently demanding. The company is also investing in mixed-use properties, meaning building things like offices and apartments connected to or near its shopping centers to help drive stronger traffic. Thanks to the healthy lease spreads it can obtain on redeveloped properties, Kimco’s returns on investment for such investments are usually about 10.5%. Despite its growth opportunities, Kimco’s AFFO per share (similar to free cash flow for REITs) is expected to decline over the next year due to the large amount of asset sales the company has planned. Cash flow should starting growing again in 2019 at a low to mid-single-digit rate as the development pipeline comes into service. However, the upcoming dip is expected to result in an uncomfortable AFFO payout ratio in excess of 100%. Management also emphasized that Kimco has no long-term debt maturing and a strong liquidity position. As the REIT’s projects reach completion and start flowing in the latter part of 2018 and into 2019, dividend coverage should start looking better. For now, it does not seem like a concern. While Kimco’s dividend seems likely to remain secure despite its elevated payout ratio, the company’s pace of dividend growth will remain very slow due to the REIT’s already enormous asset base, which can only expand so quickly. Regardless, Kimco seems likely to be capable of generating about 3% annual dividend growth over the long term. Kimco, like many REITS, faces equity price risk. Since REITs must pay out at least 90% of their taxable income as dividends, the retain relatively little cash flow to fund their growth. As a result, REITs are heavily dependent on low cost borrowing and high share prices to allow them to sell shares at accretive prices (a low cost of equity). If the share price falls too low, then a REIT’s cost of equity can rise so high that it impairs their ability to grow profitably. Kimco’s share price has been nearly cut in half since July 2016 as investors worried about the future of shopping centers, pushing its cost of equity above the cash yield it typically earns on new investments. Kimco’s strong balance sheet and large liquidity allowed it to capitalize on its weak stock price by repurchasing shares. However, with its share price still in the dumps, the company mainly has to fund growth with asset sales (capital recycling), low cost debt, and preferred shares. Historically Kimco has funded 40% of its spending needs via equity issuances. This indicates that if the share price fails to recover in the next few years, then Kimco may be unable to execute on its growth backlog and fail to achieve the modest FFO per share growth that investors are counting on to keep the dividend safe and growing. If Kimco’s shares fail to recover, say due to a bear market caused by another recession or unexpected closures at some of its tenants, then the REIT is likely to have to grow its dividend much slower than it has in the past few years. Since the financial crisis ended, Kimco’s dividend has been growing faster than its cash flow per share growth. 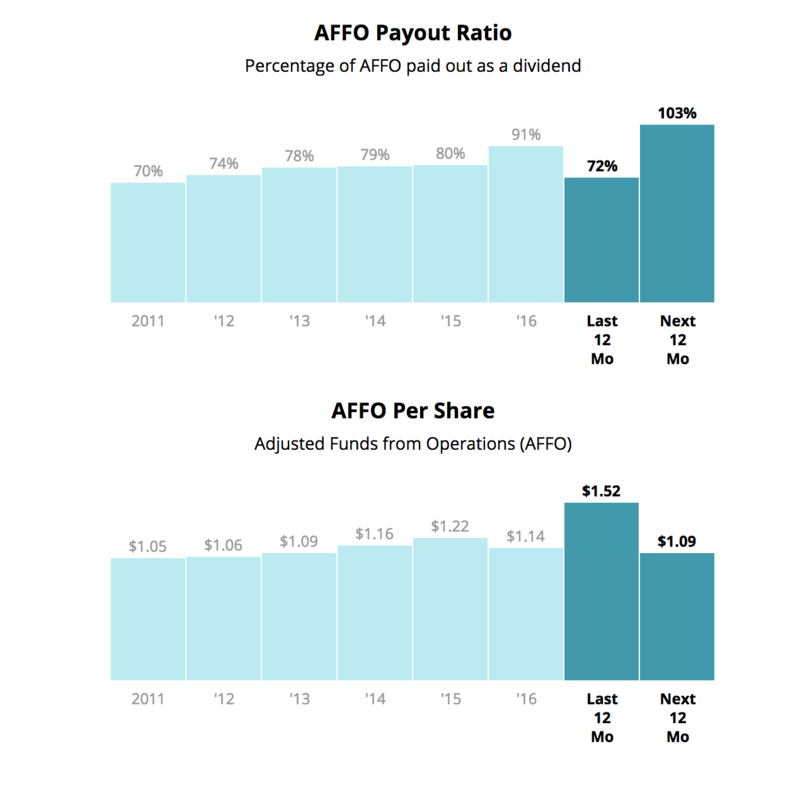 As a result, its payout ratio has been rising and its retained cash flow falling. If the firm’s cost of equity remains at today’s high levels, then Kimco is likely to have to continue with very modest dividend growth to bring its payout ratio down and lower its cost of capital, thus allowing it to be less dependent on equity markets to fund its growth. In addition, while Kimco’s tenant base is strong and relatively e-commerce resistant, the retail industry is notorious for changing consumer tastes over time. This also applies to many of the top national restaurant chains that Kimco houses within its shopping centers. Management has thus far done a great job in navigating the changing retail industry. That includes replacing the occasional failed tenant (like Toys R Us), with stronger ones whose business models are better suited to current industry conditions. However, there is no guarantee that Kimco will always be so sure-footed and adaptive. After all, 74% of its annual rent is directly or indirectly tied to grocery stores, such as Kroger (KR) and Walmart (WMT). These companies anchor most of Kimco’s centers and continue to be the most important customer traffic drivers. Both retailers are battling valiantly against Amazon’s encroachment in the grocery space. However, there is no guarantee they will succeed, especially as Amazon continues to invest aggressively into its own brick-and-mortar assets (Whole Foods), as well as same-day delivery). Walmart and Kroger are doing relatively well in growing their online sales for now, but as Amazon continues to push the innovation envelope (e.g. drone delivery), the margin-sapping costs of keeping up the battle for online grocery sales might compress the profitability of both retailers. That, in turn, could limit Kimco’s future pricing power with its anchor tenants, resulting in lower lease spreads. Kimco’s very slow expansion of its center count also means that the REIT is relying on strong lease spreads to be a main FFO per share growth driver. If lease spreads end up declining in the coming years, then growth in cash flow per share (and the dividend) could slow to a crawl. Finally, while Kimco’s business model is fairly defensive due to its large grocery focus, that doesn’t mean the dividend will necessarily be safe through all economic conditions. During the financial crisis the credit markets, the lifeblood of the REIT industry, shut down. This caused even blue chip REITs (like Simon Property Group) to cut their dividends as a way of preserving cash in response to this worst-case scenario. Kimco cut its dividend by 86%, from 44 cents per quarter to 6 cents. The REIT’s dividend has yet to return to its former high (28 cents per quarter today). Kimco (and all REITs) are unlikely to face another financial crisis anytime soon thanks to financial regulatory reform. But in the event of another major credit market disruption, conservative income investors will probably sleep better at night owning REITs such as Realty Income (O) that have proven they can continue growing their dividends even during a recession. Kimco Realty has taken several steps to strengthen its business in recent years. Most notably, the company has reduced its financial leverage and increased its focus on tenants who are most resistant to e-commerce disruption. Ongoing retail disruption (especially shopping centers) remains an ever-present threat, but Kimco’s management team has thus far proven to be skilled at adapting the REIT’s property base to maintain high occupancy and steadily rising rents over time. When combined with the company’s strong balance sheet and decent growth pipeline, Kimco seems like a reasonable bet for steady and slowly growing income over the short to medium term. However, investors considering the stock need to realize that Kimco’s risk profile is higher than some other retail REITs. The firm’s elevated payout ratio needs to be monitored to ensure that it improves after next year like management expects. How Safe Is Your Dividend Portfolio?